This weekend promises to be a scorcher around here. With all the rains the flowers are flourishing. The other afternoon I went out to take some pictures of the Black-Eyed Susan's. If you aren't familiar with the Black-Eyed Susan you can read about them here. I love their whimsy and the deep golden yellow color. Notice in the bottom right hand corner of the picture above, the Sedum commonly known as Stone Crop is starting to bloom. Sedum is a great plant to have if you have invasive wild life like deer, they don't care for the taste of Sedum. With us having 40 acres we have a lot of wild life roaming the grounds in the evenings, over the course of the last 13 years this plant has worked well for me to keep the deer away from other plants. :-)) If you're interested in reading about Sedum you can go here. Yesterday I took a few cuttings to make a flower arrangement, I discovered rather quickly they didn't last long. They started drooping almost immediately. 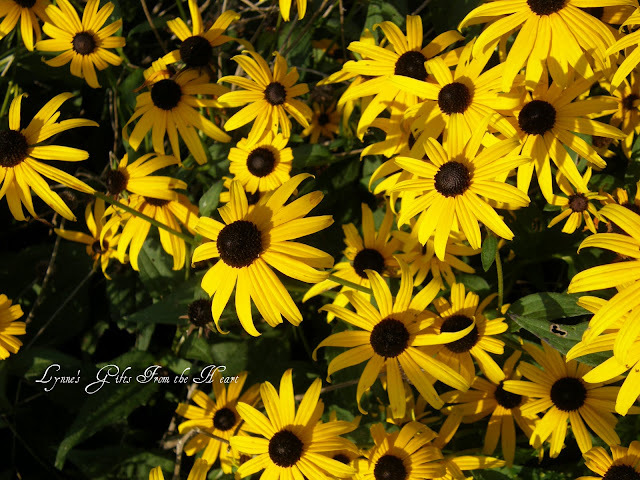 Have any of you tried them and made a successful fresh flower arrangement using Black-Eyed Susan's? If you have and had success at it I would love for you to share your secret. They are beautiful, Lynne. Our neighbor has them in the garden next to her patio...we can see them from our breakfast room. I've never tried an arrangement with them. those are one of my favs!!! They always have such a punch of color that lasts for quite a while. Enjoy them - your pictures are great!! Hope summer is treating you well!! You have captured some beautiful close up pics here to celebrate God's creation! Absolutely beautiful and pleasant to see!!! 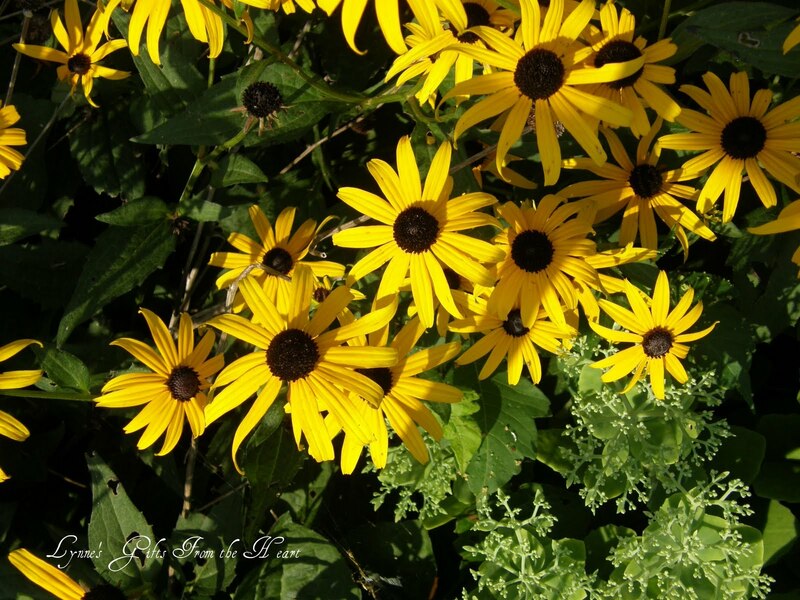 I love Black Eyed Susan's, too,Lynne!! Are they the same plant we see growing wild along roadsides? I bought some (cut) at our Farmer's Market last summer and they didn't wilt...however, they were wild (the vendor said), so that makes me think they aren't the same as yours. My DIL and son are having a John Deere party for their boy next weekend. She wanted to use sunflowers in little arrangements. 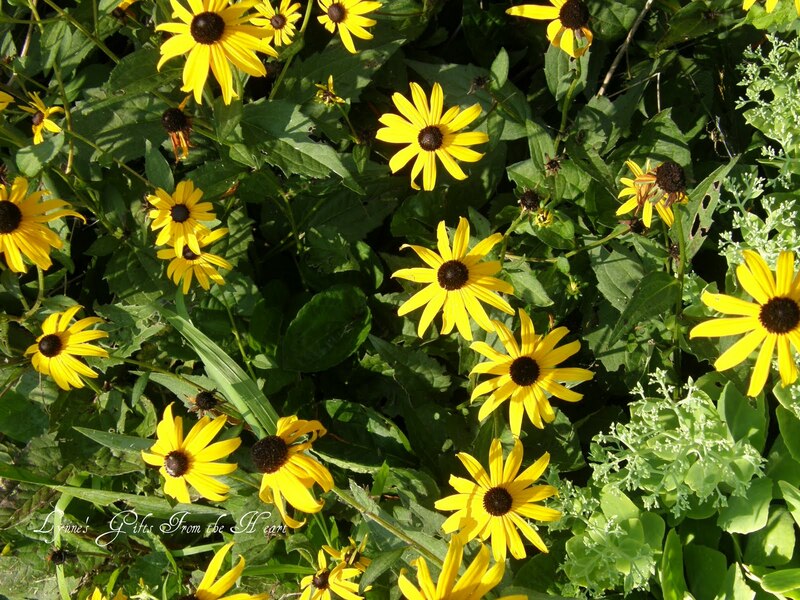 I suggested the black-eyed susans, if we can find them. They just scream HAPPY SUMMER!!! Good info about the Sedum!!! Just got home from about 3 hrs. of g.saling....OMG....I nearly melted!!! Sorry - I am of no help on making them last. They are pretty. I love black eyed susans. They are so summery and yet so fallish. Ok both of those aren't words in the dictionary, but they are wonderful. I like that they reproduce so easily and bloom for so long. Plus they are so great in bouquets. Pretty posies! I have some black eyed Susans and your right, they don't do well in arrangements. I've tried to and don't know how to make them stay pretty. Stay nice and cool, it's hot here as well! So pretty! Thank you for sharing them! Beautiful photos... Love those flowers!! Hope things are going well for you! Have a beautiful week! 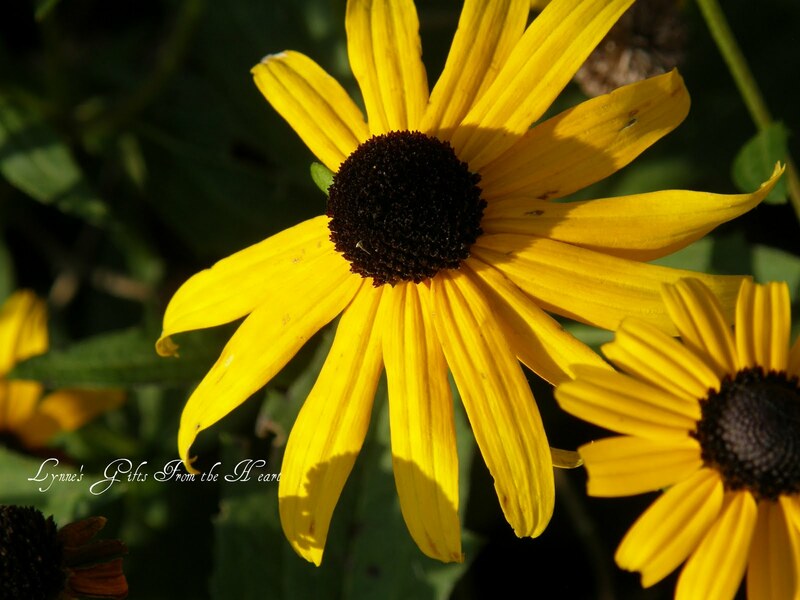 I'm not familiar with Black Eyed Susan's, but they sure are pretty! You captured some beautiful photos. Hope you are doing well, sweet friend. I think of you and Bill, often. Hi Lynn, Loved your pictures for this post! 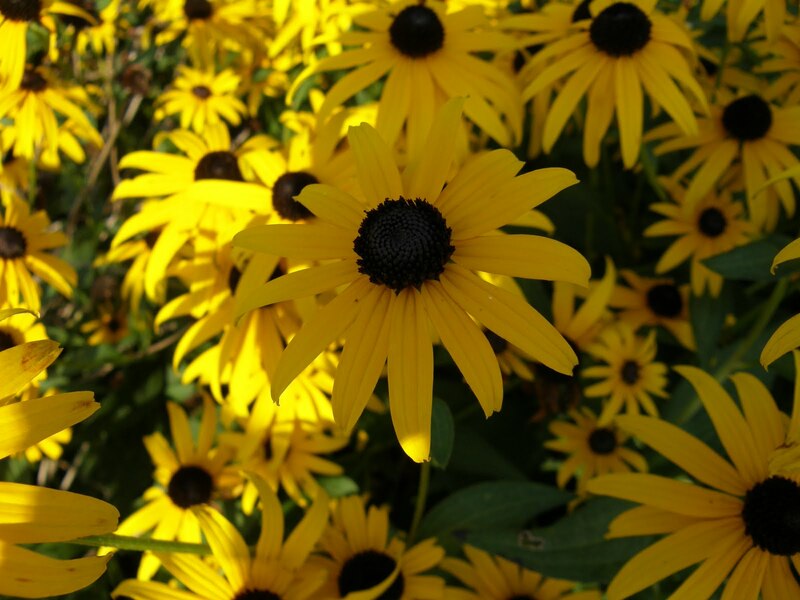 Black eyed Susan's are beautiful, aren't they? They seem to be doing very well in our area this year even with all the heat and all the rain. I like sedum too and we have it planted on the side of the fence where the deer are. So gorgeous! Have a sweet weekend! I was just thinking about you and wanted to stop by to see how you were doing, Darlin'! I do hope that my note finds you and your sweet family well! I have been out for a couple of weeks due to company and now I'm playing catch up! Hehe! Nearly impossible to do these days! Well Sweetie, your Black Eye Susans are just gorgeous! I bet they are quite "showy" out in the yard in that vibrant yellow! Girlfriend, you always take the most gorgeous photos...seriously, they could be in a magazine!!! I also took a gander down through your Autumn in the shop post. Ohhhh my...how very beautiful it looks! You have such a gift for arranging everything, Girlfriend! I stand in awe!!! Lynne-We haven't visited in SOO long, I had to pop over and see how you are. I love the blackeyed Susans and the sedum too. I wish I had more sun so I could grow these. With all my shade I am limitd to ferns and hostas! Glad to "see" you again! Sorry about the confusion on the FB thing...I don't remember visiting this beautiful blog before and I didn't know you but would love to! Have not seen you around in a while. Hope you and husband are well and staying cool. How can you stop from smiling when seeing such cheerful flowers?